TargaGenix at Stony Brook University is among nine startups to get backing from the seed fund, totaling $840,000. A state investment fund called the Accelerate New York Seed Fund has backed its first technology startup on Long Island. The fund invested $100,000 in cancer drug developer TargaGenix Inc. at Stony Brook University. The investment of state money then led a private investor, Huntington businessman Anthony Iacovone, to put $50,000 into the startup, according to Peter Donnelly, Accelerate New York’s managing director. He said TargaGenix is among nine startups—selected from about 400 applications—to receive backing from the seed fund, totaling $840,000. That sum has attracted an additonal $7 million from venture capitalists and others. The fund has $2.4 million from Empire State Development, the state’s primary business-aid agency, to invest by the end of next year. Accelerate New York is the successor to the Accelerate Long Island Seed Fund, which put $500,000 from the state into 10 local startups and is now closed to new investments. “We think the model is working. …We’re drawing stronger entrepreneurs and investors” to early-stage tech businesses, said Donnelly, who also directs technology commercialization for Stony Brook. "We plan to raise money for a third fund," he said, "to make the pitch for more state funds and private capital, because this region is underdeveloped” in terms of resources for young startups. The proposed Accelerate New York Seed Fund II would probably begin making investments in 2020. The new fund, like its sister fund, would serve Long Island, New York City and the lower Hudson Valley, and focus on aiding startups in health care, energy and advanced materials, according to Donnelly. TargaGenix, located at the Long Island High Technology Incubator at Stony Brook, is the kind of startup that Accelerate New York was designed to help. It has what experts are calling a promising technology, based on Stony Brook research, but lacks the money to get to the point where venture capitalists will invest on their own. He said the Accelerate New York money paid for experiments showing that drugs used to stimulate the human immune system, when combined with the TargaGenix drug, are effective in treating pancreatic cancer. The results formed the basis of a U.S. patent application and could help convince a pharmaceutical giant to invest in tiny TargaGenix. Egan started TargaGenix in 2013 after serving as business director for drug developer IRX Therapeutics in Manhattan. 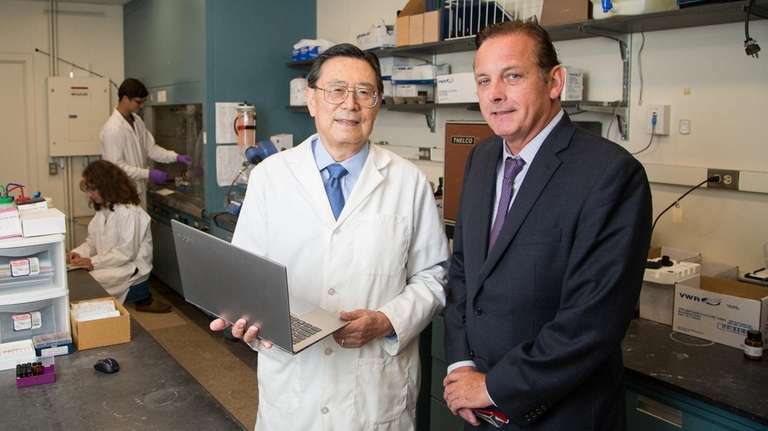 Stony Brook's Center for Biotechnology invited him to review about a dozen of its technologies with an eye toward building a company around one of them. Stony Brook soon agreed to license the technology, and Ojima signed on as a scientific collatorator to TargaGenix. Egan raised about $150,000, including some of his own money, to start the business. In 2015 he secured a $2.3 million grant from the National Cancer Institute. TargaGenix has six employees but like most startups has no revenue. Earlier this month Egan began meeting with venture capitalists in Boston and Manhattan, hoping to raise $5 million to pay for clinical trials over the next few years. Some of the trials could take place at Stony Brook, he said. “The Accelerate money provided a bridge for us to get to the next round of investor funding,” Egan said. The case of TargaGenix offers further proof that inventions from Stony Brook, Brookhaven National Laboratory, Cold Spring Harbor Laboratory and other institutions can beget companies, said Mark Lesko, who proposed the Accelerate Long Island fund when he was Brookhaven Town supervisor. Accelerate Long Island invested exclusively in startups in Nassau and Suffolk counties, while Accelerate New York invests in startups in 14 downstate counties.